When Ichabod Crane arrives in the spooky little village of Sleepy Hollow as the new schoolmaster, Katrina Van Tassel is instantly drawn to him. Through their shared love of books and music, they form a friendship that quickly develops into romance. Ichabod knows that as an itinerant schoolteacher of little social standing, he has nothing to offer the wealthy Katrina – unlike her childhood friend-turned-enemy, Brom Van Brunt, who is the suitor Katrina's father favors. But when romance gives way to passion, Ichabod and Katrina embark on a secret love affair, sneaking away into the woods after dark to be together – all while praying they do not catch sight of Sleepy Hollow's legendary Headless Horseman. That is, until All Hallows's Eve, when Ichabod suddenly disappears, leaving Katrina alone and in a perilous position. Enlisting the help of her friend – and rumored witch – Charlotte Jansen, Katrina seeks the truth of Ichabod Crane's disappearance, investigating the forest around Sleepy Hollow using unconventional – often magical – means. What they find forces Katrina to question everything she once knew, and to wonder if the Headless Horseman is perhaps more than just a story after all. 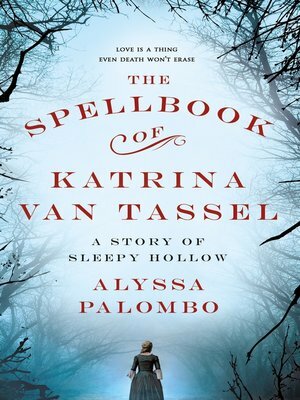 In Alyssa Palombo's The Spellbook of Katrina Van Tassel nothing is as it seems, and love is a thing even death won't erase.